Julie Nutting Designs: More Stencil Madness! Still going crazy with stencils! Once I get started on these little tags, I can't stop! I've been only using paint, so I decided to try the Distressed Stains by Ranger to see how they would look. They came out somewhat hazy, however I love the look. The stencils are from Crafter's Workshop.Using tiny scraps of paper, I then cut their outfits, getting into my paper doll zen-like state. The little hot pink jacket to the left is made of Ranger's sticky back canvas and dabbed over with their Worn Lipstick stain. 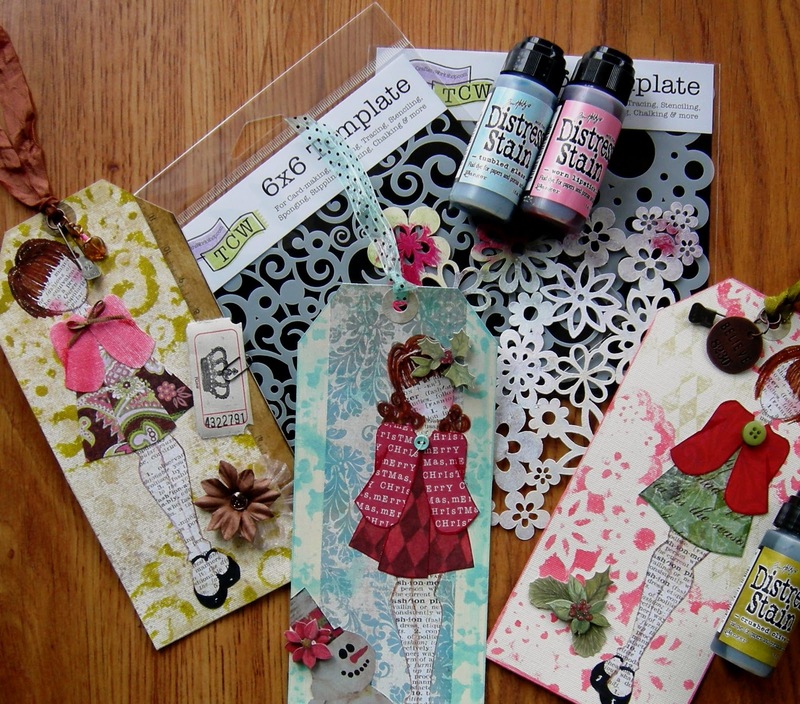 Although it's hard to see, I embellished the ribbons with some of the Tim Holtz Ideology items. I then took the color, Picket Fence and put it on a brown tag and it came out looking like gingerbread snowflakes. I had purchased the new Graphic 45 Christmas line and thought the black hollies would look amazing on the stenciled background. The little pierrot inspired me to buy this paper (more on that project later) and thought he would look adorable in the corner and was I right? Cute, cute paper! Now to figure out, who will receive these little tags on their gifts this year? I love them!!! They are so cute!!! I'm hooked on stencils and Ranger Stains, too. Almost finished with my commissioned pieces, then playtime for me!!! 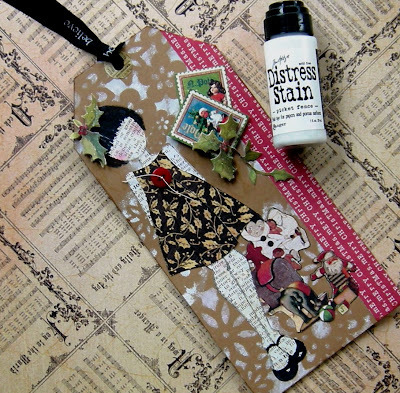 Wish I was receiving one of your darling tags! What a great idea!!! I love your tags! They are spectacular. I am just so amazed at how easy you make it look. Everytime I read one of your posts I want to order oodles and oodle of stencils, paints and papers. It is all just so pretty. I love them all...so cute! All the tags are gorgeous, my favorate one is the little girlie with the beautiful black holly dress and darling bobbed hair. I'm sure who ever is lucky enough to receive these tags will treasure hem for sure. Thanks for sharing these delightful creations. These are just way too cute! Don't you just love those stencils? They add so much depth... thanks for inspiring our pants off :D (I just bought your book by the way and speechless comes to mind...fab, fab, fab! Absolutely beautiful Julie! I just adore your work.